Bakelite jewelry (most of which was originally marketed as Catalin) goes way beyond stacks of bangles in solid colors. This popular plastic adornment was made in transparent versions, reversed carved, resin washed, and clad with metal among other variations. In some instances, several colors were even laminated together. Some of these, like transparent and clad pieces, aren't obviously identified as Bakelite, so becoming familiar with them might even yield a find you weren't expecting. Bakelite in solid colors is the most recognizable type even without employing testing measures. The most readily found colors are yellow, ranging from butter yellow to dark butterscotch, followed by various shades of green. Red is one of the most popular colors of Bakelite jewelry with collectors. All of these solid hues can be found with and without carving in a variety of shapes such as bangle bracelets, figural brooches, earrings, and dress clips like the pair shown here. Marbled Bakelite contains more than one color swirled together. The majority of marbled pieces will have a base color with one other color swirled within. Most any colors can be marbled, but green with yellow is the combination found most readily today. Butterscotch with brown is also a commonly found duo. Some collectors avidly seek marbling containing more than two colors, and those are indeed harder to find. Yes, Bakelite jewelry can be transparent in color, too. These colors vary, like with the solid color pieces shown above, but are most often found in yellow, green, and red. Clever collectors have named yellow transparent Bakelite "apple juice." Sometimes you will find a piece of red transparent Bakelite nicknamed "cherry juice" as well. These pieces can be plain or carved, and the transparent nature of the material allowed for them to be reverse carved as well (as shown below). Laminating allowed more than one color of Bakelite to be placed together for a stacked look. 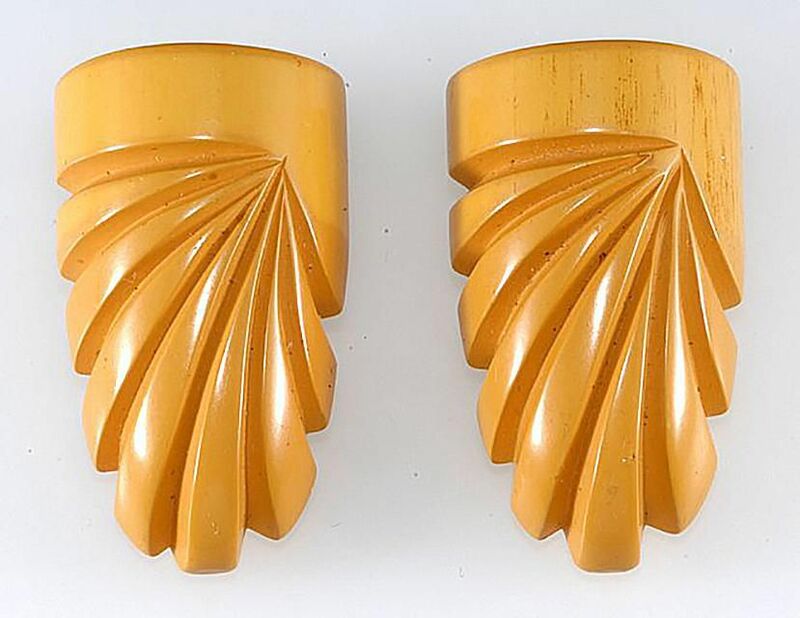 ​"Laminated with special glue and then polished as one piece, Bakelite could be combined colors, or laminated with wood or metal," according to Jane Clarke of MorningGloryAntiques.com. Some laminated pieces were cut so that they have a zigzag pattern as well. As for the laminated bangle shown here, it was originally patriotic red, white, and blue in color. The aging process has caused the white stripe to become yellow over time, according to Clarke. These intriguing pieces have carving on the bottom that shows through the top. Often the flowers and other designs are colored in to enhance the design as with the examples shown here. "Clean crisp carving with a design that can be seen easily from the front is a sign of quality," according to MorningGloryAntiques.com. Reverse carved Bakelite is sometimes confused with Lucite. The difference is that most Lucite pieces are crystal clear where the Bakelite pieces will be a transparent color, usually yellow. Most often they are combined with other solid or marbled Bakelite segments that are more recognizable as this substance. Note that Jane Clarke of MorningGloryAntiques.com adds regarding the examples shown here, "This style of bracelet is being reproduced and so far, the repros I have seen are cloudy instead of clear like these." Some contemporary Bakelite artisans also have employed this technique to decorate their creations. These designs are usually more elaborate in nature, and oftentimes have the signature of the maker within. Not all reverse carved Bakelite bracelets are stretch style, however, these are the ones found most often by collectors with elaborate decoration. Other bangles may have simple reverse carving made up of lines or notches without coloring. Resin washed, also known as overdyed, describes a decorative technique that was applied during manufacturing by wiping a wash or glaze over a carved piece of Bakelite to add highlights to the color and accentuate carving. This treatment usually darkened the piece, but the underlying color can be seen through the wash. For example, the resin wash applied to the Bakelite horse pin shown here gives a more natural appearance to its coloration. Resin wash was used on many figural designs, but can also be found on bangle bracelets and other pieces from time to time. The term overdyed was previously popular, but more and more collectors are now referencing these pieces as resin washed today. This type of Bakelite of Canadian origin is rarely found and has quite a following with collectors. It consists of a piece of Bakelite as a base, whether a bangle bracelet or a brooch, that has metal "clad" over the plastic. The metal can have a copper, silver, or golden hue although most likely some type of shiny alloy rather than actual gold, copper, or silver. Pieces can be partially clad with metal or completely encased. Many of the pieces that are partially clad have metal over green marbled Bakelite. When Bakelite is showing through the design or visible on the interior of a piece, it can be tested to confirm the material. If it is completely encased in metal, one must learn to discern the look of clad pieces in comparison to other types of bangles made of solid metal. The bangle bracelet showed here, with hard to find textured gold overlay in excellent condition, is considered to be a "maiden's" bangle due to the size of the opening. "The standard bangle is 2-1/2" in diameter, but I collect these smaller 2-1/8" to 2-1/4" diameter Bakelite bangles because they are just my size, and I am always in the market for them," said Jane Clarke on her MorningGloryAntiques.com site. Prystal was a trade name used for a type of transparent Bakelite marketed by the American Catalin Corporation in a number of different colors. Even though it was technically made of Catalin, most collectors still reference it as a type of Bakelite. It does test positive for Bakelite but can have a unique look bi-color look about it. "Prystal often a is a dichroic (color changing) Bakelite, and in this case, the bangle is green with plum highlights," said Jane Clarke of the example shown here on her MorningGloryAntiques.com website.